Combat trauma, a component, variant, or synonym for PTSD (depending on whom you speak to), is a specific research interest in the oral history interviews that I conduct. My presentation at the 2015 Oral History Association conference provides some poignant examples for this topic. In short, I am investigating whether combat Veterans across the generations (WWII, Korea, Vietnam, Iraq, and Afghanistan) share common combat trauma experiences, and if so, how they are similar or different. Next, if there is a sharing of combat trauma across the generations, I want to know what common experiences could explain the similar or different symptoms of combat trauma. Finally, if certain generations of combat Veterans do not exhibit combat trauma symptoms, I intend to investigate what factors could lead to the lack of combat trauma. In support of PTSD Awareness Month, I thought it would be great to share a very excellent article from the Veteran Voice Newspaper, reprinted here with permission, concerning PTSD, its origins, treatment options, and where local Veterans can get help. Many thanks to author Patrick McCallister and Veteran Voice Newspaper for allowing me to reprint this article for you. Tucked away in Port St. Lucie’s western side there’s a VA facility hidden away in a strip of offices. It’s about as nondescript and secluded as can be for something right off an I-95 exit. “Veterans sometimes do have a hard time finding us the first time,” said Elizabeth Bosarge, PTSD Program Manager at the West Palm Beach Department of Veteran Affairs’ Medical Center. “There’s a reason for the seclusion. That little hidden-away office is home of the Department of Veterans Affairs St. Lucie County PTSD Clinical Team Outpatient Program. This spring it turns 10. It opened in 2007. The West Palm VA opened the facility, because it noticed that many seeking help for post-traumatic stress disorder were coming from St. Lucie and Indian River counties. “The numbers indicated there were many veterans north of the VA medical center,” Bosarge said. She was with the team that opened the office. In recent years the VA has doubled its size and added medical components, such as audiology and prosthetics. “It’s now the Port St. Lucie Clinic and a couple VA specialties are there,” Bosarge said. Dozens of veterans a year have gotten treatment for PTSD at the center. It has individual and group sessions. 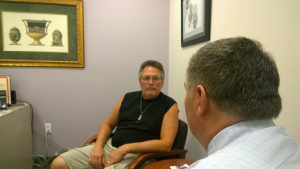 About 65 percent of the clients are Vietnam-era veterans. However, it’s helped World War II to operations Enduring and Iraqi Freedom veterans. The clinic has long used three evidence-based therapies to help veterans with PTSD. While it’s not exclusive to combat veterans, they’re one of the highest risk groups to develop PTSD. According to the National Institute of Mental Health, people are wired to detect and respond to danger. The so-called “fight or flight” survival response that generally serves us well. PTSD, essentially, is when a person remains in the alert state long after danger has passed to the point that it’s negatively affecting his or her daily life. The existence of PTSD as a primary anxiety disorder was once controversial. It wasn’t until 1980 that the condition was formally recognized in the “Diagnostic and Statistical Manuel of Mental Disorders,” or DSM. Although PTSD as a primary disorder was controversial, its existence had long been noticed by those in the medical and psychological professions and given many names — battle fatigue, shell shock, and even railway spine, a presumed neurological condition doctors noted among train wreck survivors in the 1800s. Train wrecks were commonplace at the time, and survivors often complained about debilitating sleeplessness and agitation. Once PTSD was recognized as a primary condition, psychiatrists and psychologists went to work developing approaches to treating the disorder. Among them was Dr. Francine Shapiro. She’d noticed that different eye movements seemed to intensify or reduce stress when one was having disturbing thoughts and memories. That led her toward developing a complex hypothesis about how eye movement related to traumatic thoughts. Shapiro pioneered Eye Movement Rapid Desensitization and Reprocessing, EMDR, one of the therapies used at the Port St. Lucie facility. Another therapy used at the clinic is Prolonged Exposure Therapy. It seems counterintuitive. Those using the therapy are repeatedly exposed to the very memories they’re using unhealthy means, such as drugs and alcohol, to avoid. Therapists don’t rush clients into recalling traumatic memories. They first ensure that trust is established and clients have learned self-comforting techniques. The other therapy used at the clinic is Cognitive Processing Therapy, which is related to prolonged exposure. At first Cognitive Processing Therapy sounds like some sort of pop psychology based on verses of ancient religious writings. In short, it holds, belief becomes reality — change the mind, change the person. Those receiving the therapy not only relive memories, but explore them for details that recast their meanings. For example, a soldier whose PTSD is worsened by the guilt of thinking he or she should have seen a coming ambush may remember there were climatic conditions that reduced visibility while recalling painful memories during cognitive processing. Bosarge said the VA is looking at adding additional programs at the clinics to help healing veterans grow, too. Among them are yoga, along with art and music therapies. “That’s a goal for the future, it sure is,” she said. Veterans who suspect they have service-related PTSD should report their symptoms to any VA medical professional. Those experiencing acute symptoms, such as sudden restlessness or nightmares, should either immediately go to VA medical centers, or call the Veterans Crisis Line, (800) 273-8255, extension 1. Veterans can also contact the Crisis Line by texting 838255. Friends and family members can call the Veterans Crisis Line if they’re concerned about a veteran. If there seems to be immediate danger, call 911. This article was originally written for and published in Veteran Voice, a weekly print newspaper. Yearly subscriptions are available for $12 by calling (772) 204-0123.